← Christmas Patterns in May? At the Spring International Quilt Market, we introduced a new pattern, The Collecting Memories Bag pattern, designed by Nancy Dill. This is a pattern for a bag that is autograph-able and pin-able! It includes two bottle pouches, 2 inside pockets, 2 outside pockets and a place to put a pen. Buy the Collecting Memories Bag Pattern here. While at Quilt Market, we decided to try the bag out. 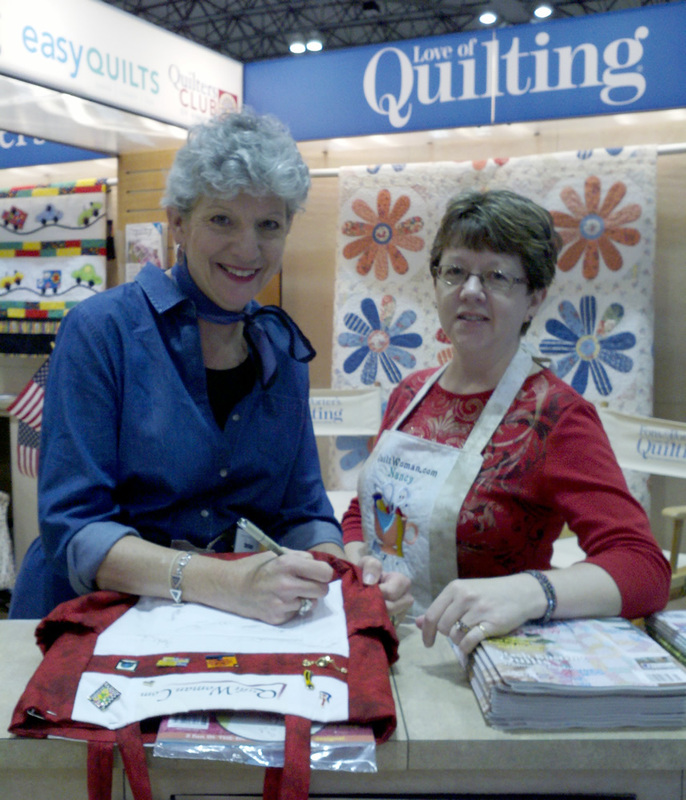 Nancy, who also happens to be the President of QuiltWoman.com, scoured the show floor for autographs of Quilting Personalities. Nancy succeeded in getting 33 celebrities to sign the bag. Check out the list! Click on the image below to see it larger. 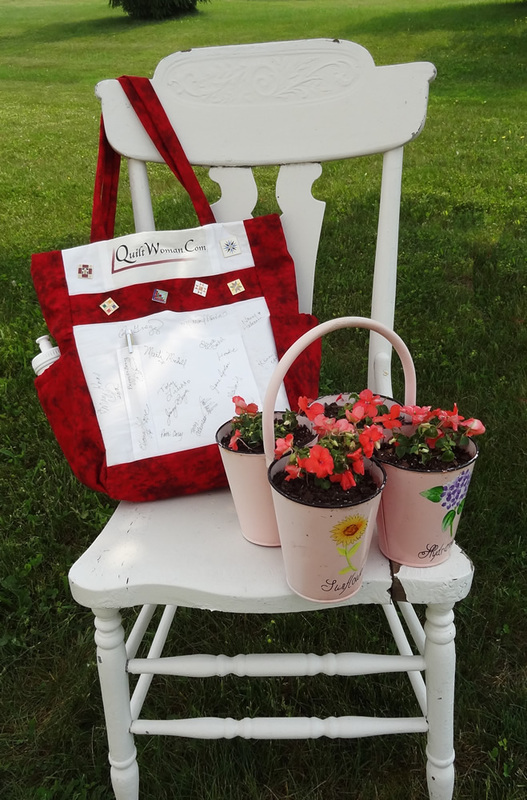 This autographed Collecting Memories Bag can be yours! We are having a silent auction of the bag, with 100% of the proceeds benefiting the American Heart Association. Included with the bag are a Micron archival .25 mm black permanent fabric pen, six enameled quilt block pins, AND the pattern for the bag. Bidding will start at $25. Every time the bid hits a new increment of $10, we will throw in a QuiltWoman.com pattern of the winner’s choice. Every time the bid hits a new increment of $25, we will throw in a QuiltWoman.com book of the winner’s choice. Daily, we will post the high bid on QuiltWoman.com’s home page, our Facebook page, and in the comment section of this blog posting. Bidding will continue until June 30. Don’t delay! Get your bid in today. You would be the envy of every member of your guild when seen toting this bag! This entry was posted in Charity, patterns and tagged Bag Pattern, Charity. Bookmark the permalink. email your bid to info@quiltwoman.com. 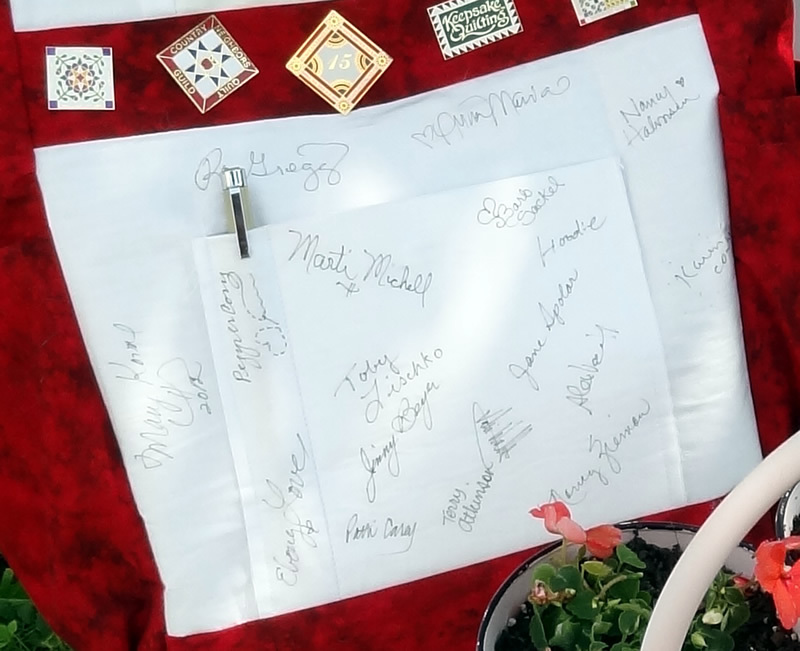 We will post the day’s highest bid on our website (http://quiltwoman.com) and on our facebook page. Check there tomorrow to see what the current highest bid is. I would like to raise the bid to $100.